CCCU. Little Book of Thunks: 260 Questions to Make Your Brain Go Ouch! 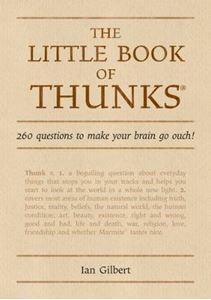 Little Book of Thunks: 260 Questions to Make Your Brain Go Ouch! Quick overview A Thunk is a beguiling question about everyday things that stops you in your tracks. This book includes the thunks which cover areas of human existence including truth, justice, reality, beliefs, the natural world, the human condition, art, beauty, existence, right and wrong, good and bad, life and death, war, religion, love, and friendship. Following the success of "Little Owl's Book of Thinking", Ian Gilbert now introduces "The Little Book of Thunks". A Thunk is a beguiling question about everyday things that stops you in your tracks and helps you start to look at the world in a whole new light. The Thunks in this book cover most areas of human existence including truth, justice, reality, beliefs, the natural world, the human condition, art, beauty, existence, right and wrong, good and bad, life and death, war, religion, love, friendship and whether Marmite tastes nice. Examples include: If I borrow a million pounds am I a millionaire? Could a fly cause an aeroplane to crash? Are you man-made or natural? Do dogs believe in God? When you comb your hair is it art? The book contains a comprehensive introduction by Ian who guides you through the origins and uses of Thunks and how best to use them.Not only are they a fun way to develop thinking skills but they also hit all the right buttons in the National Primary Strategy 'Creative Thinking' strand where children are encouraged to: generate imaginative ideas to stimuli; look at and think about things differently and from other points of view; and 'ask "why", "how", "what if" or unusual questions'. This is a great resource for teachers to use in the classroom - and remember there are no right or wrong answers to these questions. How liberating is that...?